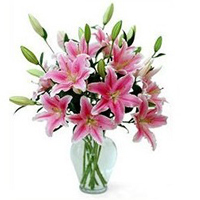 Send this lovely gift of Expressive Lilies in Pink Color with Vase to your dear ones and make them feel very happy. The Vase design may vary a little. These awesome Oriental Pink Lilies (12 pcs) are sure to wim hearts. ( Vase may vary ). In case of Same Day Delivery orders, we reserve the right to replace the oriental lilies, if not available with equal value of Asiatic lilies.